In an effort to promote its 4G wireless network and to grab the attention of iPhone aficionados, T-Mobile is setting up an unusual challenge this weekend. If you live in the Seattle area and you own an iPhone, you are officially invited to bring it to any of the participating locations and attempt to beat the Samsung Galaxy S 4G in a download speed test. The reward? You will instantly become a thousand dollars richer. Aurora Ave. N. & 135th St. 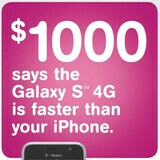 The speed challenge promo starts tomorrow, April 29, and ends on Sunday, May 1, and if you manage to grab the $1000 by beating T-Mobile's Galaxy S 4G with your iPhone, do not forget to share it with us in the comments! Or any other 3G phone for that matter. Excuse me but who is T-mobile getting bought out by? Oh yeah that's right, At&t. Haha. they probably chose locations where their network speeds peak out while AT&T's has a crappy signal soooo..almost everywhere. xD here's what you do though, you take a LTE MiFI and have it connected to your iPhone, easy money. Yeah good luck with that MiFi stunt since you're iPhone will show it's connected to it through Wifi. what would be awesome is if their network just suddenly craps out on them during this promotion.